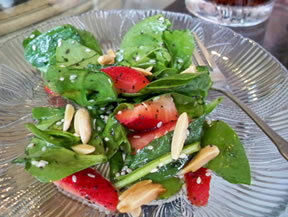 Although strawberries with lettuce isn't your normal combination, this salad is a must try. These ingredients combine perfectly for an elegant and delicious lettuce salad. In a pan, toast the almonds and the sugar over medium heat. Stir frequently until just after the sugar melts and coats the almonds. Immediately remove from heat onto wax paper or foil to cool, making sure to separate the almonds with a fork. For the dressing, in a medium bowl, whisk together vegetable oil, sugar, apple cider vinegar, parsley, salt and pepper. 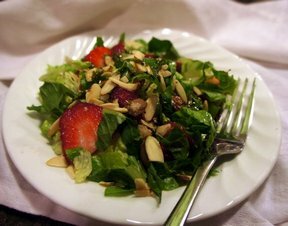 In a separate large bowl, toss romaine lettuce, strawberries, and cooled almonds. 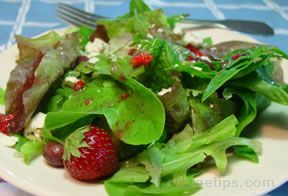 Drizzle dressing over salad just before serving and toss to blend. 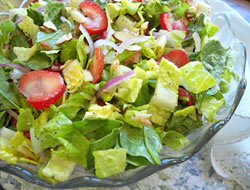 "A sweet salad dressing with the sweet strawberries and crunchy almonds. The sugar didn't coat the almonds, but still melted and added the sugary sweetness beside the almonds. Next time I might add a little butter in with the almonds and sugar to see if it will stick better."